Black toenails? Cringe-worthy blisters? Cracked heels? If you’re a serious runner, you’ve probably experienced one of these nasty ailments that can put a pause on your training, send your favourite flip flops into retirement and make you gag every time you look down, yikes. 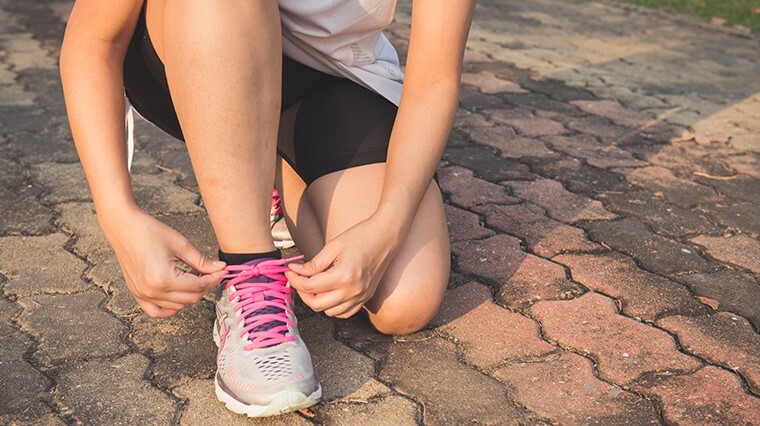 Your feet work super hard to get you across the finish line – it’s well worth your time to give them some TLC to keep them in top form by putting our tips into action. Perfect fitting shoes are a runner’s best friend whereas poorly fitted shoes can damage your feet in numerous ways. A small amount of wriggle room (about a thumb width) can prevent black toenails caused by the repetitive trauma of the toe impacting the front of too short a shoe. An improper fit may also cause blisters – whether the shoe is too wide, creating friction as the foot shifts inside the shoe or too narrow, pinching the skin. Many leading brands of running shoes like Asics, Brooks and Mizuno offer their key ranges in varying widths to accommodate different foot types. As tempting as it is to throw on cotton socks with a cutesy pug or space invaders print, well-fitted running socks are a priority for your sweat sessions and they come in both minimalist and cushioned styles. A high quality running-specific sock will be breathable, sweat-wicking and prevent friction between your skin and shoe for an irritation-free ride. By keeping your feet dry, they decrease the risk of developing athlete’s foot caused by moisture-loving fungus having a party between your toes. Dry feet are at risk of heel fissures and when these deepen so far that you could fall into them and wake up in another dimension, it hurts like heck. The repetitive impacts of running can only do more damage, leading to bleeding and infection – and let’s not even picture dirt or hair getting trapped inside those nasty cracks, yowch! Having soft, silky feet is one of life’s little joys - apply a heel balm or moisturiser to feet daily post-shower to lock in the hydrating goodness and stop painful, cracked up heels before they start. Seasoned runners know that recovery is just as vital as training, but you can’t throw on any old flip flops after a marathon and call it a day. Specialist brands like OOFOS have produced ergonomic recovery sandals to support, rejuvenate and take the pressure off tired feet post-run. They pamper your feet on the go, absorbing shock so you can hit the pavement fresh for tomorrow’s sweat sesh. Speaking of pampering, treating your tootsies to a self-massage or dishing out for a professional massage once a week will help protect against heel and arch pain like plantar fasciitis, keeping your feet and mind relaxed. Using massage and stretch recovery tools like mini foam rollers or massage balls to gently apply pressure beneath your feet can relieve problem areas from tension. Consult your podiatrist for a foot analysis and advice on proper massage technique. As hard as it is to give up your fave pair of runners, once they hit the 500km – 800km mark, it’s time to let them go. When exactly may depend on your body build, running style (light or heavy foot strike) and running surface. At this stage the shock absorbing characteristics deteriorate and the tread will wear out soon after, making you not only more injury prone but less comfortable, and your body will feel it. Toe strengthening exercises keep your feet flexible and limber, reducing risk of common running problems such as plantar fasciitis and shin splints. Stretching small muscles that are underused when wearing shoes can improve your mobility and stability, and may also give your push-offs that extra oomph. To perform a toe curl for example, place your foot flat on a small towel on the floor and use a scrunching action of the toes to grasp and bunch up the towel towards you. Repeat five times, then move onto the next foot. We get it – when you’ve caught the running bug, breaking up your routine with a rest day can leave you fidgety, as if a cranky kitty cat is living under your skin. To avoid rest day guilt incorporate yoga, swimming, cycling or strength training as part of your active recovery. This will give your feet a break from the repetitive pressures of running while targeting different muscle groups.